When the three young men in suits, white shirts, and ties knocked at my door around midday several months ago, I perceived they might be Mormon missionaries and told them I had my own church and sent them on their way. Actually I did nothing of the sort. I listened carefully to their presentation about our need to take better care of our families and to focus more on God’s plan for our lives. Then I invited them to come in. Thoughtfully, all three took off their shoes before following me down the hall-way to our kitchen table where I learned these tall, attractive 20-year-olds were indeed Mormons sharing what they believed to be a last-day message to help folks like me get right with God. The young men turned down my offer of juice or water and proceeded to share some Bible texts with me from their heavily-highlighted King James Bibles. After a few minutes, I agreed for them to come back to study with me at a designated time about four days later. I was appalled. “You’re telling me that the Spirit of God can’t reach a person who’s been brainwashed?” I asked. He laughed and said, “No, not really,” and wished me well. But I could tell he didn’t think much of my chances at successfully sharing Bible truth with them. A few days later, the missionaries showed up on schedule and began studying with me. In advance of their appearance, I had asked the Lord to be in charge of the meeting and my re-sponses to what they shared. I told them that the Bible was my ultimate authority for my belief system. In that first meeting and during the next several that followed, I strove to focus on re-lationship building rather than scrapping with them over some of their unscriptural statements. For instance, the missionaries claimed that children can’t sin and that all of mankind had a spirit existence before coming to this earth to receive human bodies, two positions with no biblical support. See I Corinthians 15:46-47 for a clear Scriptural answer to their spirit-existence error. I asked questions about their families, how long they had been Mormons, if they had girlfriends, what their career aspirations were, what their experiences were like as missionaries. I also communicated how challenging it must be making cold calls door to door in behalf of what they believed. They agreed that it really was challenging. In letting the missionaries know I was a Seventh-day Adventist, I initially pointed out the similarities between our two churches: both arriving on the world scene within about 30 years of each other, both claiming to have a prophet, both having a health message, and both believing it represented God’s remnant people living near the end of time. Several weeks later when my wife Diane had baked some cookies, I asked her if we could give some to the missionaries. She agreed and prepared two nice assortments. When I called and invited them to come by when they were in our area and pick them up, they were most appreciative and showed up the next day to get their goodies. We also invited them to dinner a few weeks later in a local restaurant. They accepted, and although I swallowed hard when one of them ordered a $25 filet mignon, just about the most expensive item on the menu, we had great fellowship with them and did more relationship building. In fact, we learned that being a Mormon missionary means a very controlled existence: No calls home except at Christmas time, no TV watching, a very conservative food allowance. In short, a highly-regulated existence 24-7. They told us they are even told when they can and can’t drive their cars. In addition to my focus on relationship building, I adopted the following strategy when it came to our Bible studies. I deliberately didn’t bring a Bible to the table, but expressed puzzle- ment when the missionaries shared unbiblical information. When that happened, I would ask if they’d mind if I got my concordance. In this way I could look for texts that depicted the truth about a particular topic. The way this worked was they’d look up and read aloud texts that actually contradicted their erroneous statements right out of their own Bibles. It was very powerful. I could feel the anointing of the Spirit during our encounters. For instance, when the missionaries told me that children were not able to sin, I asked them to read Psalm 51:5 where King David says, “Surely I was sinful at birth, sinful from the time my mother conceived me.” I could almost see the missionary blanch as he recited that text. (See also Genesis 8:21). But I was very gentle with them. Rather than debate, I said, “Perhaps what you really mean to say is not that children are unable to sin, because obviously they can, but rather that God doesn’t count their sins against them before they reach accountability.” They quickly agreed with that thought even though it wasn’t what they had been saying. And so our studies went along like that. Whenever they would present something unbiblical, I’d ask them if they had any biblical support for that point, then hunt in my concordance for Bible truth on the matter. They’d read it aloud, and I would let it sink in without putting them down or engaging in debate. I felt that presenting Bible truth in any kind of combative way would be defeating to the Holy Spirit’s reaching them with truth. Also, before each visit I would ask the Lord to empty me of self and claimed Galatians 2:20 that only Jesus would come through in all of my interaction with them. On their third visit, the missionaries gave me a copy of the Book of Mormon. I could have rejected that and said it was the Bible only for me. However, by my accepting their book and doing the reading assignment they gave me, I was accepting influence from them. This, in turn, allowed me to have influence with them. When I did my own research, I often found amazing information that totally contradicted what they were teaching, and it was right out of their own Book of Mormon. For instance, a week later after we had been discussing the Ten Commandments, includ-ing the Sabbath, I was able to show them in both the Book of Mormon and the Bible the contin-uing importance of the Fourth Commandment. So that you can understand what I am talking about, here is the simple study on that topic that I prepared and shared with them. In terms of commandment keeping, what did Jesus say about any changes to His commandments? “Until heaven and earth disappear, not the smallest letter, not the least stroke of a pen will by any means disappear from the law until everything is accomplished.”– Matthew 5:17, 18. What does the Bible say about a person who says he’s a Christian, but doesn’t obey God’s commandments? “The man who says, ‘I know him,’ but does not do what he commands is a liar.”– I John 2:1-4. What is the terrible fate of the person who is convicted about a Bible truth and does not act on it? “They received not the love of the truth that they might be saved. And for this cause God shall send them strong delusion that they should believe a lie.”–2 Thessalonians 2:10-11. What are God’s final instructions to His people who find themselves in Babylon? “Come out of her my people, that you be not partakers of her sins, and that you receive not of her plagues.” —Revelation 18:4-5. “And if any man shall add unto these things, God shall add unto him the plagues that are written in this book.”—Revelation 22:18-19. Obviously perplexed at this study, one of the missionaries said, “Can’t we talk about something else?” I replied, “We certainly can. But I’d like to point out to you that each of our churches believes it is God’s remnant with God’s final message to mankind before Jesus returns. Each of our churches teaches that commandment keeping will be one means of identifying the remnant, but your church asks for a ten percent discount, having decided to replace one of the Ten Commandments that God Himself wrote in stone. In response, the missionaries talked about Christians no longer being under the law. Happily, I was able to explain to them the difference between the Ten Commandments and the Law of Moses (see Deuteronomy 10:5; I kings 8:9; and Deuteronomy 31:26) which pointed toward Jesus’ sacrifice on the cross. When the missionaries shared their personal testimonies about their belief in Joseph Smith’s prophetic gift, I showed them the nine-volume set of Testimonies to the Church by Ellen G. White and expressed my belief in Ellen White’s prophetic gift. I also exposed them to her five-volume Conflict of the Ages series. One of the missionaries began reading one of the Testimonies volumes and couldn’t put it down, even as the others were trying to leave. I encouraged him to take any two of the volumes and he did. Dan Serns, NPUC ministerial director, told me later that the missionaries are told to tell on each other if they get concerned about the worthiness of one of their colleagues. I never learned how reading the Testi-monies impacted this young man, but when the missionaries returned a week later, I found it more than interesting that they returned without him. They told me he had been reassigned, but offered no reasons why. During that visit, they asked me if I would visit a nearby Mormon church that they at-tended. Diane and I did visit their church and then invited them to attend our Rockwood Church in East Portland. At our next meeting, they asked if I had any questions, and we told them we were surprised that they used water rather than grape juice or new wine when they celebrated the Lord’s Supper. We told them we thought water to be an odd symbol for blood. They said that Joseph Smith had authorized that change. They agreed and I closed our encounter with prayer, claiming this promise and asking God to make very clear the truth about His remnant people. During the days that ensued, I was often flat on my face telling the Lord that this was His battle, that I recognized I was helpless in the matter. I pled with Him to give these fine young men no rest day or night, but to give them an overwhelming conviction about the truths He had permitted me to share with them. The missionaries missed their next appointment. They missed next week as well. Three weeks later, two new Mormon missionaries appeared at my door. I invited them to come in and asked them what had happened to their predecessors. After reviewing with them what my experience had been with the first group of mission-aries, I agreed to study with them. Each shared his testimony how he had prayed about his re- lationship to Joseph Smith and his church’s beliefs and was sure he was in God’s remnant church. Once again, as the Lord enabled me, I focused on relationship building and minimized all scrap-ping over doctrinal differences except to gently question all statements they made that were un-scriptural. I also pointed out that it’s possible to be sincere, but sincerely wrong as Saul was when he was persecuting God’s true church before he became the great apostle Paul. I also made it very clear that God tells us in the Bible to test the prophets not by our feelings (I John 4:1), but by how their teachings square with Scripture (Isaiah 8:20). I told them that Adventist Church co-founder Ellen White’s writings had to measure up with the Bible or they could be disregarded. I added that I would be terrified if my church allowed its prophet’s writings to replace any Scripture. Since that time I’ve been flat on my face again asking God to work His miracle and over-whelmingly convict them of the truth about His Commandments and other important subjects such as the nature of man which the Mormons teach is divine. By the way, here is a copy of that study for your possible use. Prepare to be surprised, if not shocked, when you read what the Book of Mormon says on this topic. The Mormon missionaries ultimately admitted that the Bible does not have ultimate authority for their church. They said their prophet has ultimate authority. And that’s not just Joseph Smith. Whoever happens to be leading their church corporately is deemed to be a prophet, his words equal to the Bible. That includes their 12 apostles as well. I let them know again that the Bible alone was the ultimate authority for my religious beliefs. Not my church, not my church’s prophet, not my feelings, but the Bible. So what is one to do? As I’m writing this, four different missionaries have come and gone and two new ones are studying with me. Was the Lord able to use me to communicate the truths of God’s Word to them? I believe so, and I continue to pray for them. I told both groups that I could only imagine how challenging it would be for them to let the Bible have ultimate authority for their beliefs and how devastating it would be for them to become Seventh-day Adventists. Then I told them I hoped they would consider doing exactly that! I gave each of them a baptismal certificate containing Adventist church beliefs and told them I would do everything in my power to help them make their transition to God’s true remnant, including help with obtaining a Christian education at an Adventist university. 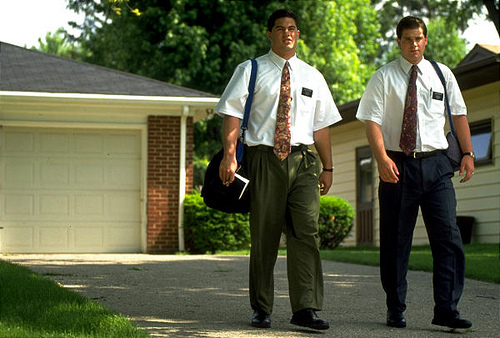 Are the Mormon missionaries sincere? you may ask. You bet they are. Sincere but sin-cerely wrong. You and I may not be able to reach them, but God can. So let them into your home when they appear at your door, love them during your encounters, share the truths of God’s word gently and let the Holy Spirit empower your words. Then fall on your face before and after each visit, pleading with the Lord to open their eyes and give them “no rest day or night” until they have decided for or against Him and the truths of His word. Another benefit in accepting their visits is this: The truths of your biblical Adventist beliefs will take on a fresh, new vitality in your life as you share them and as they are tested in your discussions. In the process, your own heart will be wonderfully renewed by the life-giving power of God’s Word. So if you haven’t thought how something as simple as opening the door of your home could get you started participating in the Year of Evangelism, may I encourage you to begin con-sidering the possibilities when the young missionaries show up. But should I really invite them in when they appear at my door? I say absolutely! Re-member, God promises, “My word, I send it out and it always produces fruit…it will prosper everywhere I send it.” (Isaiah 55:11, NLT). What a joy to be able to share God’s awesome Words of life right in your own home. As you offer the missionaries a drink of water or a piece of fruit, think about the time Jesus fed the 5,000 and remember God’s promises to all of us: “You are My witnesses…and my servant whom I have chosen.” Remember, too, that “the battle is (not yours, but) the Lord’s.” (Isaiah 43:10; I Samuel 17:47). Some have asked me if I study with Jehovah’s Witnesses when they call. I do if they are willing to study with me out of non-Watchtower Bibles. So far, none has been willing to do so. Mike Jones heads “Operation Reconnect,” an outreach to inactive and former members. A retired pastor and former editor of Insight, he’s also authored four books including Help, Lord, I Blew It Again. Mike presents seminars on how to reach inactive family members and others who no longer attend church. Filed under Changed Lives, Soul Winning, Why Not Try This?